In an encounter in Parliament in 1917 with the anti-war campaigning poet Siegfried Sassoon, Winston Churchill put forward the idea that “War is the normal occupation of man”. Following a scornful look from Sassoon, Churchill amended his words adding “…War and Gardening”. The human occupations in this quote encapsulate the classic dichotomy of war and peace, but are there ever moments in time when these two extremes collide? Throughout this year the nation is commemorating the 100th anniversary of the First World War. After a tip off from our very own Clive Smith I have discovered evidence that suggests Drogo’s garden may have some very surprising connections with the ‘Great War’ that have up until now been overlooked. The unprecedented number of casualties of the First World War produced an entirely new attitude towards the commemoration of war dead. Previously individual commemoration was often on an ad hoc basis and was almost exclusively limited to commissioned officers. The scale of the 1914-18 war required mobilization of a significant percentage of the population, either as volunteers or through conscription. Due to the horror of trench warfare and the scale and cost of human sacrifice, an expectation had arisen that individual soldiers would be commemorated, whatever their rank. The war office in London was also aware that dignified treatment of the bodies of the fallen would contribute to the morale of those still fighting. A committee under Frederic Kenyon, Director of the British Museum, presented a report to the Commission in November 1918 detailing how it envisioned the development of the cemeteries. Two key elements were that bodies should not be repatriated and that uniform memorials should be used to avoid class distinctions. Beyond the logistical nightmare of returning home so many corpses, it was felt that repatriation would conflict with the feeling of brotherhood that had developed between serving ranks. The scale of the war cemetery construction was immense and this ‘architecture of death’ came to form a major part of Lutyens’ work. Gavin Stamp in the foreword of the book ‘Lutyens and the great War’ hints at the irony surrounding Lutyens successful career… “The terrible war that brought an end to the complacent civilisation which sustained Lutyens’ practice also gave him the opportunity to rise to the highest levels of creativity”. In the aftermath of the war Lutyens was to spend more than a decade designing civic war memorials, war cemeteries, village memorials, institutional memorials and individual tombs. Lutyens received his knighthood not on the back of the myriad of domestic commissions but in recognition for his work in New Delhi and the war cemeteries. After his death the full realisation of the debt of gratitude owed by The Imperial War Graves Commission to Lutyens and the small group of architects became apparent. It was recognised that they were fortunate to find a man in Lutyens who could rise to the height of the task that faced them in 1918; that of dedicating the genius of British architecture to the memory of a million men who died in the supreme struggle for liberty. Stamp suggests that Lutyens’ genius lay in his fertile three dimensional imagination and the ability to continually transform classical forms into something modern whilst retaining a depth of sensitivity to the site and landscape. By the time Julius Drewe turned his attention to creating a garden at Castle Drogo in the mid 1920’s, his architect Edwin Lutyens carried not only the confidence of a successful man at the top of his career but also the maturity and depth of understanding available only to those who live through extraordinary and difficult times. In both their eyes you see the kind of maturity that is only bought at a price. I was surprised to hear that Julius Drewe’s grave in Drewsteignton church yard was also designed by Lutyens and perhaps this reflects the depth of the personal relationship and mutual respect the two must have built up. Thanks to Jonathan Lovie’s research we knew that Lutyens had adopted a classical and modern approach to the garden here at Drogo but I have been bowled over to discover strong similarities between Drogo’s garden and many of his war cemetery designs. Up until now this has been a missing piece in the jigsaw. It seems that Stamps suggestion that Lutyens was the master of composing endless variations on a theme is also true for Drogo. 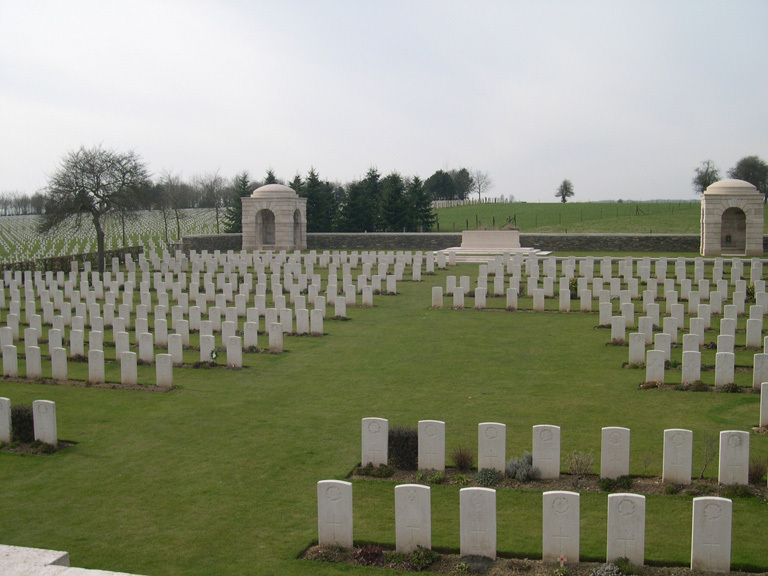 La Targette British cemetery. The two shelter houses and general layout are remarkably similar to the lower formal garden. The graves are planted with floribunda roses and perennials as suggested by Gertrude Jekyll to recreate a small part of England. Villers-Brettoneax cemetery, again the same basic layout as Drogo’s garden. I have often thought the garden here at Drogo had the layout of a castle. Many of these war cemeteries also have the look of a military camp about them. 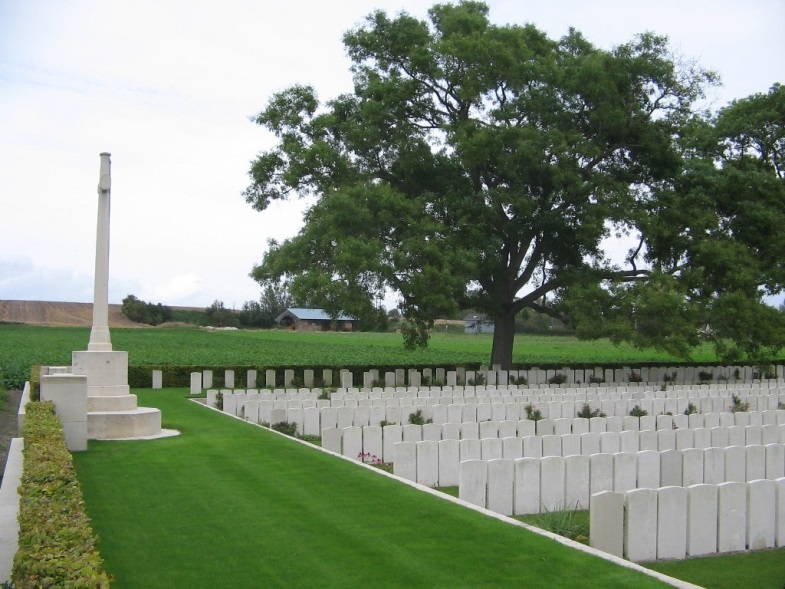 La Neuville British Cemetery Somme (below). The raised entrance terrace is very reminiscent of the terrace surrounding Drogo’s Rose Garden. 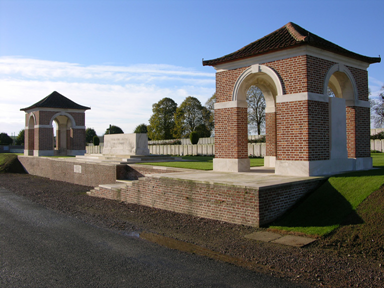 Serreroad Cemetery; again a strikingly similar plan to Drogo’s formal garden complete with corner shelters, hedges and shelter belts. The many shelter buildings reminiscent of the Pavilion rooms at Drogo were designed to give visitors a place for quiet contemplation and prayer. Because of the cost involved they were restricted to the larger cemeteries. To conclude this short piece, I have found it fascinating to discover that at Drogo the influences of a world war are so clearly visible in the design of the garden. Perhaps it is fitting that Lutyens should create a garden here that carries with it the memories of the fallen, thinking of Adrian, Julius’ eldest son and the castle builders who never returned from the trenches. With our focus on the anniversary of the outbreak of war, the echoes of a bygone age can still have a powerful impact in the present; I have been moved just from looking briefly at images of the war cemeteries. The challenges of war and peace are still just as fundamental to our existence as they were to that generation. In the garden here at Drogo we discover clues to suggest that our current peace and prosperity were bought at a high price.